Your first appointment with South Downs Osteopathy will last up to 60 minutes. The majority of this time will be spent taking a detailed history, assessing your posture and examining you. It is important for Ross to gain detailed information about the symptoms you are reporting, along with information about your general health and past medical history. This allows Ross to assess your suitability for osteopathic treatment as well as identifying possible contributing factors involved in your symptoms. You may then be asked to undress to your underwear in order to properly assess your posture and examine you. If you prefer, a loose pair of shorts and vest top can be worn. After studying your posture, Ross will ask you to perform a number of different movements before examining the painful area and other surrounding areas that may be involved. Depending on your symptoms, Ross may choose to perform additional medical tests, such as taking your blood pressure and pulses, listening to your breathing or testing your reflexes. All of the above steps help Ross to provide you with a diagnosis, and collaborate with you to devise a management plan. If deemed appropriate, Ross will give some treatment at the first visit. This will usually focus on the painful area, saving broader treatments for follow-up visits where a lot more treatment time is available. Ross will also provide advice on how to improve your symptoms at home and answer any questions you have. Occasionally you may be asked to see your doctor for additional tests before Ross can be certain your symptoms are something that can benefit from osteopathic treatment. 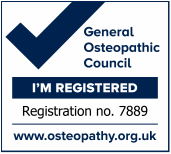 Sometimes osteopathic treatment will not be considered appropriate and Ross will refer you to a more suitable practitioner.